The Queen Butterflies are continuing to reproduce prolifically in my backyard. They are particularly drawn to lay eggs on a Mexican Blood Flower (Asclepias currasavica) that is generally in full sun. This plant is barely hanging in there after getting eaten by numerous caterpillars for months. The funny thing is we have three more Mexican Blood Flowers and three Pine-leaf Milkweeds in a less sunny location, and while the butterflies will feed on the nectar, they don't seem to lay eggs in that less sunny location. 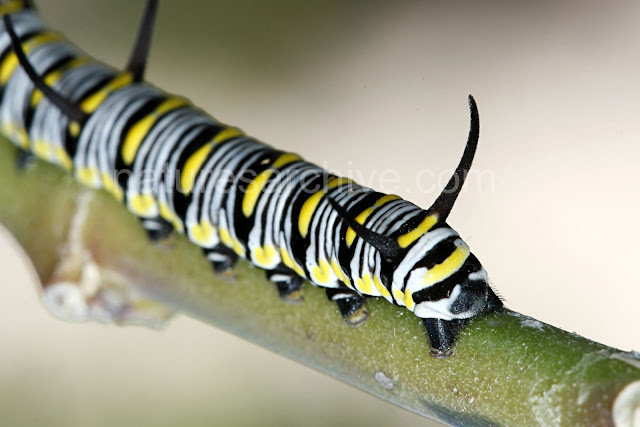 The caterpillar below was one of 5 on the plant currently. I've documented the Queens of Maricopa previously - see the series Queen Butterfly, which shows adults, larvae, and chrysalis.